Recently there has been some extraordinarily interesting articles in the press on the value of 3D printing in surgical procedures. In particular the United Kingdom seems to be leading the way in producing and using 3D printed implants for use in reconstructive surgeries, as recent articles in the BBC, the Daily Telegraph and The Independent publications highlight. Mr Craig Gerrand, a consultant orthopaedic surgeon in an NHS hospital in Newcastle-Upon-Tyne, England, recently announced the success of producing and fitting half of a 3D printed titanium hip into an unnamed patient who was suffering from chondrosarcoma. Chondrosarcoma is a cancer of the cartilage cells and typically tends to affect the axial skeleton. In this case the unnamed patient suffered severe damage to one half of his hip due to the effect of the destructive cancer. In an effort to stop the spread of the cancer, which rarely responds to radiotherapy or chemotherapy, the surgeon was forced to remove half of the patient’s hip (termed an hemipelvectomy, which can be external or internal dependent on if the leg is to be amputated as well). Before this, however, Mr Gerrand was able to construct and print a 3D titanium half model of the patient’s hip which, along with the added attachment of a hip socket replacement, he was then able to implant into the patient following the removal of the chondrosarcoma affected bone. The fake hip was based on scans and x-rays of the patient’s own hip for anatomical reasons and was fully produced using a 3D printer. The printer used lasers to fuse together titanium powder, which slowly built up a model of the hip layer by layer. The fake hip was then coated in a mineral into which the remaining bone in the patient’s healthy hip could fuse with, providing long-term stability during recovery and mobility. Although the news articles on the case were only recently produced, the actual surgery itself was carried out over 3 years ago. Wonderfully the patient continues to manage to walk with mobility aids, something that would be unthinkable if the surgeon had not been able to print and implant the titanium hip. In other news recently, as reported by the BBC, the Welsh victim of a vicious motorcycle accident was able to benefit from the 3D printing of custom parts for use in maxillofacial reconstruction. The use of 3D printing was used at each stage of the procedure, including the planning of the surgery and the reconstruction itself, by using titanium parts to stabilise or replace parts of the patient’s own facial bones. Following the motorcycle accident, which severely damaged both of the patient’s zygomatic bones as well as sustaining damage to the maxilla, frontal and nasal bones, the patient’s face was reconstructed in a series of operations. To achieve the aim of improving the patient’s face to almost pre-accident standards the surgeons scanned the skull of the individual using a CT scanner and printed the results using a 3D printer, the results of which helped to produce a symmetrical model of his skull to help plan the surgery in detail. By using cutting guides and by being able to measure the facial skeletal anatomy directly, they managed to print titanium plates to match the symmetry of the patient’s face originally, and likely minimised the time the patient spent under anesthetic. In the article the patient, from the city of Cardiff in Wales, movingly states how he now looks as he did before the motorcycle accident, adding that he was able to go out in public once again following the reconstructive surgery. A model example of how the surgeons helped plan the surgery to improve the motorcycle accident man’s face with 3D printed titanium implants. The image shows the left zygomatic arch with the titanium implants in white against the model of the cranium. (Image credit: The BBC 2014). The two innovative procedures above are fine examples of the value of integrating the latest technology into the operating theatre, but they also highlight some themes of the body and surgical intervention that interest me. 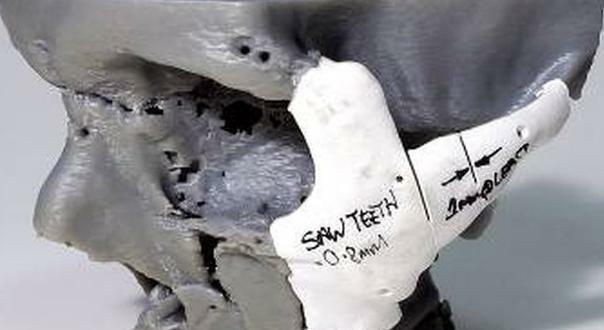 The benefits of being able to 3D print specific and specially made parts offer a ‘continuation’ for the patient of their own bodies, even with the distinct disconnect (and often intrusive procedures) between the effect of the trauma or disease process and the reconstructive attempts at re-structuring the body, as highlighted in the above orthopaedic cases. 3D printing is a fast-moving technology in the medical world, where even the possibility of being able to bioprint human organs and tissue is fast becoming a possibility for the future. Perhaps most significantly it offers the option for the patient to use their own bodies (or, more specifically, their cells) to help cultivate a ‘second chance’ organ or tissue in the lab using artificial scaffolds to grow the tissue needed. To a small degree this has already been carried out with certain tissues, but further work is needed to be able to bioprint human organs properly. But back to the use of 3D printing in orthopaedic surgery. Reconstructive orthopaedic surgery generally aims to improve the quality of life for the individual through physical manipulation and internal or external fixation of an implant onto, or into, the bone directly. The benefits of this are not just anatomical but often also psychological, perhaps more so in maxillofacial procedures. The patient may feel that their appearance has improved dramatically, or that they have been made to look more normal. This can increase the positive social perception of the patient themselves and boost self-confidence. Of course there are always risks associated with reconstructive orthopaedic surgery, the first and foremost being the fact that more damage may occur as a result of the often intrusive procedures, particularly the risk of implant fatigue and possibility of macro/micro fracture of surrounding bone material. Internal and external fixations also often run the risk of infection, more so when there is the risk of repeated surgical interventions. Internal fixation (such as intramedullary rodding) has the possibility of deep bone infection, whilst external fixation (such as the use of the Ilizarov frame) often results in small localised infections. Nevertheless the risk of infection by implant is often controlled for by using clean surgical rooms, sterilised medical equipment and the infusion of antibiotics during and post-surgery. Further to this, antibiotic laden cement is also often used during the surgical fixation of an implant as an added protector against infection through the introduction of foreign bodies. I am also interested in the after effects of surgery in the perception of the self. Titanium implant parts are typically manufactured for general use, although there is a dizzying variety of screws, plates and rods available to the orthopaedic surgeon. Of course they are also shaped and made to fit the patient to a certain degree. Titanium is a fairly hefty metal, with the patient often being able to tell that something heavy has been implanted into the body upon awakening from surgery. It also often hammered or screwed into the bone, sometimes causing the bone to fracture or microfracture during the process, or afterwards as the patient starts to weightbear. (As a side note orthopaedic surgeons are often built like rugby players because of the demanding physical aspect of orthopaedic surgery). The new generation of 3D printed parts are often made of different materials than purely consisting of titanium. Importantly there is the option to help improve the post surgical integration of existing bone and ceramic implants (such as hip replacements, which often use ceramic femoral heads) through the ability to print intricate designs to help meld with bone, and the ability to seed the ceramic scaffolds with the patients own cultured cells to promote healthy bone growth (Seitz et al. 2005). This is purely speculation and conjecture, but I wonder if the newer materials used, are of a much lighter material than titanium and are, as a result, less intrusive to the person undergoing the surgery? What the 3D printing of implants offer is the opportunity to make identical and specifically made models of the patient for their own use (Fedorovich et al. 2011), by either basing the custom build on an existing bone of the patient or by specifically making a part to improve what has either been lost to a disease process or a traumatic incident, to name the two main causes for orthopaedic reconstructive surgery. There are also opportunities to help promote wound healing and prevent infection during and post-surgery (Lee et al. 2012), a step that is needed considering the rise of drug resistant germs, the general decline in pharmaceutical companies producing new antibiotics, and the widespread misuse of antibiotics in general (Mayo Clinic release). 3D printing then, I believe, is an important step in advancing and improving the techniques, approaches and materials used in orthopaedic surgery. Watch Ben Garrod’s Secrets of Bones BBC TV series to learn more about just how wonderful the skeleton is. Learn more about the remarkable 3D print of his skull here. Kristina Killgrove, over at Powered by Osteons, has a series of posts on her attempts to integrate 3D printing with teaching human osteology, check it out here. The frankly amazing news of the Netherlands surgeons who were able to produce a 3D model of a patient’s cranium which was then successfully implanted can be found here, although there has been a lack of evidence for this procedure in other mainstream or medical publications. Fedorovich, N. E., Alblas, J., Hennink, W. E., Oner, F. C. & Dhert, W. J. A. 2011. Organ Printing: The Future of Bone Regeneration? Trends in Biotechnology. 29 (12): 601-606. Lee, J-H., Gu, Y. Wang, H. & Lee, W. Y. 2012. Microfluidic 3D Bone Tissue model for High-Throughput Evaluation of Wound-Healing and Infection-Preventing Biomaterials. Biomaterials. 33 (4): 999-1006. Seitz, H., Rieder, W., Irsen, S., Leukers, B. & Tille, C. 2005. Three-Dimensional Printing of Porous Ceramic Scaffolds for Bone Tissue Engineering. Journal of Biomedical Materials Research Part B: Applied Biomaterials. 74B (2): 782-788.